One year on from the 2013 race, which finally ended a season that had been over for many races, we see Lewis Hamilton and Nico Rosberg head a completely different championship challenge. With the British driver extending his championship lead at the last race, Hamilton looks to have gained what many media personalities point to as the psychological advantage, but we’ve seen many unlikely title victories before. Rosberg has never been under this level of pressure and scrutiny before, so maybe he’ll come out and deal with it in an unexpectedly authoritative way. Who knows. Anyway, back to the actual host of the 2014 event. The track was created as a result of a suburban development between two reservoirs near Sao Paulo, and the financial misfortune of the developers, whose goal was to turn it into houses. As the motor racing scene grew, the Automobile Club of Brazil took advantage of the land and turned it into what would be one of the most famous circuits on the Formula One calendar. The first Grand Prix was held at the track in 1972, which was won by Carlos Reutemann, before the track hosted five consecutive World Championship Brazilian Grands Prix between 1973 and 1977. The race disappeared to Rio de Janeiro for one year, and then the hometown of Nelson Piquet became the sole host of the race from 1981 to 1989 after the local government would not invest into the Interlagos circuit. The Brazilian Grand Prix has been held at the Interlagos track (renamed as the Autodromo Jose Carlos Pace from 1985) ever since, albeit on a smaller 4.3 kilometre circuit rather than the original circuit, which was almost eight kilometres long and is still visible from aerial photos of the circuit. Today, there are talks of improving it by building a new pitlane complex between turns 3 and 4, but nothing has come of that just yet. In any case, it is good that such a fantastic circuit has been actively attempting to ensure its long term future on the calendar, starting with improvements to the pit lane that have seen a reworked (and hopefully less dramatic) pit lane entry added, as shown throughout social media and on tj13 earlier. The circuit starts with a tight downhill S bend, before going into a high speed curve and straight that makes up the first DRS zone on the track, one of two places where drivers can get up to a top speed of around 315 kilometres per hour (the other being the final straight). Following this, the track curves round as the tight, twisty second sector begins. The third sector is effectively an opportunity for the drivers to accelerate as much as possible out of turn 12, which is always fun to see, and does provide a good overtaking opportunity going into the end of the DRS zone and turn 1. The cars are on full throttle for around 70% of the lap, and will be looking at making 42 gear changes over the 4.3 kilometre high downforce circuit. The lap record at the circuit was set by Juan Pablo Montoya for Williams in the 2004 Brazilian Grand Prix. If you bet against Lewis Hamilton for this one, you are a brave, brave person. He’s on form, as this is the first time he has ever won five races in a row, a streak that is joint fifth in the list of most consecutive wins by a driver (a record, like many others, currently held by Sebastian Vettel). He has won the same number of races in the last five rounds as he did during his entire championship-winning 2008 season. Nevertheless, Nico Rosberg will be looking for victory, and he can claim one minor achievement this weekend – if he ends up on top in qualifying, he will win the FIA Pole Trophy. Unfortunately for him, he has only converted two of his nine pole positions this season into a win, and as the mathematical geniuses among you will have worked out, only Felipe Massa has had a worse record on that front this season (1 pole, no wins), proving that these statistics are, of course, fairly meaningless. Only two drivers on the grid have won the race on multiple occasions – Sebastian Vettel (2010, 2013), Felipe Massa (2006, 2008) – and those two drivers are the only ones on the grid to have achieved multiple pole positions while only three races have been won from pole position since 2003. The Interlagos circuit, in the heart of Sao Paulo, is the second-shortest lap of the year after Monaco, with a series of twists, turns and elevation changes that provides a fascinating challenge for drivers, cars and of course tyres. The medium and soft compounds have been nominated for Interlagos, but traditionally there is a high risk of rain, and the initial long-range forecasts predict wet weather for at least part of the weekend. The sheer number of corners packed into just 4.309 kilometres means that the tyres constantly have work to do, and the relative lack of any long straights does not give them the chance to cool down. Furthermore, the track is well known for being bumpy, with high-speed turns and small run-off areas, demanding maximum concentration from the drivers. Above all, Interlagos is known for its enthusiastic fans and unique atmosphere. It’s a circuit where many titles have been decided in the past, but with double points on offer for the 2014 finale in Abu Dhabi, that will not be the case this weekend. 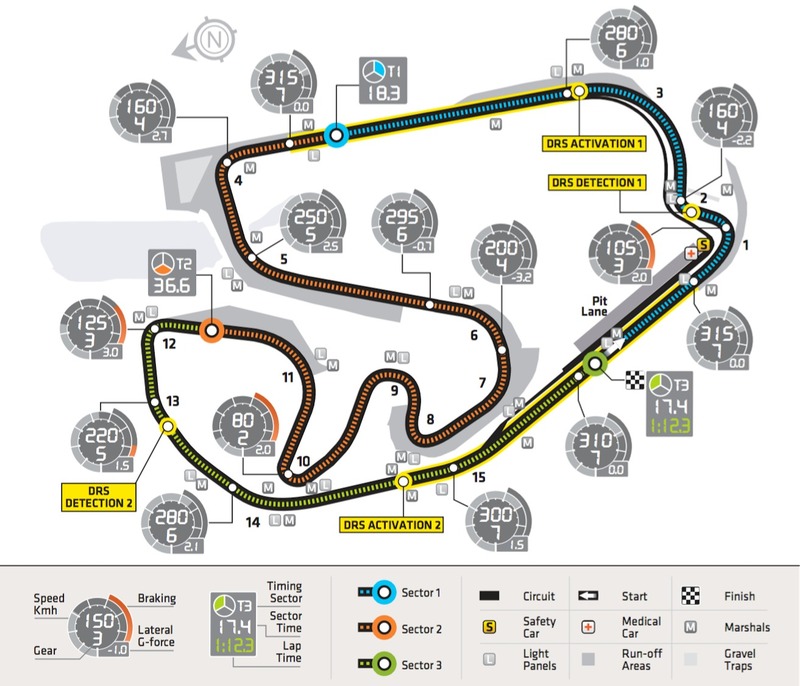 Interlagos is one of the few circuits of the year that runs anti-clockwise (together with the Circuit of the Americas and Yas Marina – meaning that the season end consists entirely of anti-clockwise layouts). The medium tyre is a low working range compound, capable of achieving optimal performance even at a wide range of low temperatures. The soft tyre by contrast is a high working range compound, suitable for higher temperatures. This has an effect on the race strategy. Tyres are often subjected to combined forces at Interlagos: lateral and longitudinal demands at the same time. This raises the temperature of the compound. Downforce levels are generally high, with aerodynamic and mechanical grip requirements roughly in equal proportion. The winning strategy last year was a two-stopper. Red Bull’s Sebastian Vettel started on the medium tyre, ￼pitted for the medium again on lap 24, then switched to the hard compound on lap 47. Prior to the start of the race there had been no dry running, complicating the strategy calculations. This is a very “driven” track with long, fast turns that translate into not-so-demanding braking sections. Of the track’s 7 braking sections, none are particularly difficult for the braking system which has plenty of time to cool down despite the fact that the drivers have a foot on the brake pedal for about 14% of the time. 1980 – The final race on the original Interlagos track saw Gilles Villeneuve take the lead after the start, but due to a lack of pace with his Ferrari in comparison to his competitors, he was overtaken by three of his competitors by the end of the second lap. John-Pierre Jabouille led the race, while Didier Pironi, Jacques Laffite and Rene Arnoux gave chase, before Pironi retired with a skirt problem, Laffite had an electrical problem and Jabouille had a turbo failure, handing the lead to Arnoux. 1991 – Notable for Ayrton Senna suffering gearbox problems, leading him to have to drive around without third, fourth and fifth gears. With the Brazilian trying his hardest and taking corners in sixth gear, he managed to hold of Riccardo Patrese to take the victory, an act that would leave him so exhausted that he would have to be lifted from his car. 1993 – Alain Prost seemed to have the title race under control, but despite not being affected by a big accident on the first lap, he spun off and hit Christian Fittipaldi as the rain started to fall. This brought out a safety car that led to Damon Hill’s lead over Senna being wiped out, and the Brazilian took advantage to overtake the Brit and take both victory and the lead in the world championship. 2003 – David Coulthard and Rubens Barrichello were involved in a battle for the lead as torrential rain kept falling on the circuit. The Brazilian driver spun off, before Coulthard and his teammate Kimi Raikkonen pitted, putting Giancarlo Fisichella in the lead for the Jordan team, despite starting the race in last place. Webber crashed into the wall, and then Alonso was not able to avoid the debris, leading to a red flag. Eventually the stewards awarded the race victory to Raikkonen as he had led on lap 53, but a court decision said that the result should be taken from lap 54, the lap after the McLaren driver pitted. 2008 – Lewis Hamilton dramatically won the Formula One world championship on the final lap of the final race of the season at Interlagos. Needing to finish in fifth place to have any chance of becoming champion while Felipe Massa led the race, Sebastian Vettel overtook the British driver to take fifth place, but on the final lap Hamilton got past Timo Glock – who had the misfortune of staying on dry tyres – in order to win the championship. This week, Formula One welcomes the domestic Porsche Cup and Porsche Challenge series to their race weekend. Currently, the Porsche Cup standings are led by ex-F1 driver Ricardo Rosset, who is currently eleven points clear of Constantino Jr. in second place, with five races to go (three this weekend, and then two in the final round). Rosset took part in Formula One between 1996 and 1998, starting 33 races for the Footwork, Lola and Tyrell teams, although in his final two seasons he was unfortunate enough to race for a team that pulled out after one round in 1997, and then to have a negative relationship with his team in 1998. Despite his F1 career not reflecting his talent in feeder series, he has gone on to win the Porsche Cup Brazil twice, including last year. In the Challenge class, Fabio Alves is ahead of Kreis Jr. by 12 points, with the gap narrowing after Alves failed to finish the previous race. The leader has won more races (3 to 1), but they have both finished in the podium positions the same number of times this season, and like the series above, they have five races to go. seem to show new pitlane complex between turns 3 & 4. Might this go some way towards negating Hamilton’s apparent consistent race pace advantage over Rosberg ? Shall be interesting to observe! Let’s just hope that there are no leprechauns affecting the brakes or the steering wheel of either car!! Can Brazil really afford to invest tens/hundreds of millions of dollars in a racetrack with their current economic condition? I wonder how unfinished it really is….